The goal of this project was to re-use materials from the old porch where possible and aim for a rough Adirondacky look. This screened in porch was re-constructed on a site where the old porch had heaved due to piers that were not done properly. We took down the old porch and used the excavator to lever up the deck so we could set new piers. Then we lowered the old deck framing and re-attached it to the house. We were also able to re-use the old floorboards as wall covering on the inside of the walls. We partially sanded off the old dark stain and then oiled them with Penofin Verde. 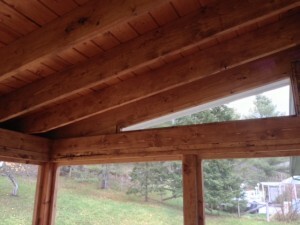 The rafters and tongue and groove roof boards are stained with mahogany stain and then oiled. We also oiled the cedar deck boards with the Penofin product.